If you think more about your motivations for war tax resistance, it can help you to choose a way to get started. You can read about motivations or watch our 30-minute introductory film Death and Taxes or watch this webinar from Feb. 18, 2017. Other factors will influence your method of resistance also: whether you are salaried, self-employed, off-the-grid, below taxable income, etc. But don’t let yourself get bogged down by too much weighing the options. You can always adjust your method as your resistance develops. Summarized below are a few war tax resistance methods. Some are more convenient to some people than to others. And some methods are better than others at meeting particular goals. Each method also has a different set of risks associated with it. File and refuse to pay your taxes. This involves filling out a 1040 form and refusing to pay either a token amount of your taxes (e.g. $5, $10, $50), or a percentage representing a “military” portion (see the federal spending pie chart), or the total amount (since a portion of whatever is paid goes to the military). See Filing and Refusing for steps to get started. Resist the local telephone excise tax. The federal telephone excise tax historically has been related to wars and excessive military spending. It appears on local-only landline phone bills. Refusing to pay this tax is a low risk method of war tax resistance. See Hang Up On War. Send a letter of protest with your 1040 tax form. Enclose it along with (but do not staple it to) your form. Send copies to your elected officials. 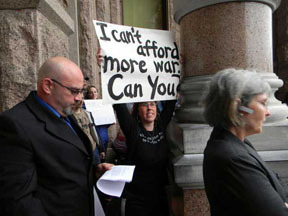 Write letters to the editor protesting taxes for war, especially when people are thinking about taxes during tax filing season between January and April. Write a message of protest on the check you send with your tax forms. Pay the tax with hundreds of small-denomination checks or coins. Lobby for Peace Tax Fund legislation that would allow conscientious objectors to pay taxes to a fund that would not be used for military spending. Leaflet and protest before and on tax day. File “Part A” of the Peace Tax Return. For more information see the book War Tax Resistance: A Guide to Withholding Your Support from the Military , or contact a war tax resistance counselor.